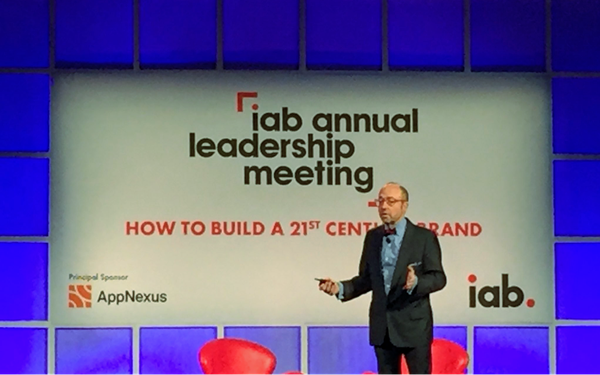 "A two-way relationship is more valuable than a one-way impression," said Randall Rothenberg, chief executive officer at the Interactive Advertising Bureau, kicking off day two of the IAB Leadership Summit in Palm Desert, California. The IAB on Monday published research indicating that growth in most consumer categories is shifting to brands centered on direct-to-consumer relationships and agile supply chains that are flexible enough to serve consumer needs as they evolve. In fact, according to research by J.D. Power cited by Rothenberg, two-thirds of all U.S. consumers expect direct connectivity to the companies from which they buy goods and services. Increasingly, brands are going direct to consumers through what Rothenberg called a "supply chain as a service" business mode -- meaning that rather than maintaining resources and capabilities in-house, companies can now buy individual supply-chain functions as needed, such as distribution of goods and products sold. Rothenberg said it's one of the support structures holding together this direct-to-consumer business model. He urged attendees to serve the needs of direct brands or become a direct brand to create direct relationships. The emerging business models includes direct to consumer, subscription commerce, on-demand and second-hand marketplaces. "We believe this is a revolution, but it's important to give this revolution a name," he said, calling it "the direct brand economy," and dating its origin to 2010 -- the year Warby Parker was founded. In this economy, the supply chain lives in four stacks: Production, Attention, Fulfillment, and Data. All functions are available to rent. And there is no credible data that suggests brick-and-mortar will come back into favor, he said, citing Nike's goal to reach $16 billion in direct-to-consumer sales by 2020. So the advertising model must change. Rather than becoming the connection between the brand and the consumer, agencies must help the brands as they develop their own relationships. Brands want to know their consumer, Rothenberg said, urging the audience to bring brands a three-dimensional view of their customers. This will become a priority for the IAB in 2018, with new studies such as the Direct Brands Benchmarking Study, and separately, a conference with the same focus during the fourth quarter of the year.